Can you keep from being attacked by the whimsical Whisk or the torching Flame Thrower? Defend your Bunnies with the Magic Spatula, or use a Feed the Bunny card to starve out an opponent! It's off-the-wall strategic fun in this fast-paced card game where the goal is to survive and claim the Magic Carrot to win the game! 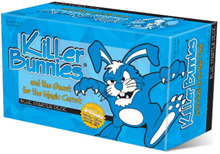 Other products in the "Killer Bunnies" series. I love this game! My family plays it every holiday, especially easter! We may be twisted folk, but we have a good time! This is such a wacky game but so much fun. Sometimes you need a break from heavy strategy. I love the creative card ideas and pop culture references. I especially love launching weapons at my opponent's bunnies. It is always fun even if I don't end up with the magic carrot. This is a fun group game, drawing cards and trying to collect enough carrots to win, the only problem is the other rabbits just may try to take you out. A great game to get your family involved very light and not a lot of thinking, but just a blast.